The Stand Up for Bute petition. Organisers of the Stand Up For Bute petition are pleased that concerns on the island have been recognised by Argyll and Bute Council. SNP branch convenor Isobel Strong and Bute Community Council chairwoman Marlene Hill are delighted with Argyll and Bute Council’s introduction of a new logo and strapline created for the island: ‘Choose Bute, Love Bute’. Isobel Strong said: “I believe that this outcome demonstrates that things can be changed when people are willing to listen. Marlene Hill added “As a community council we are not a discussion forum but are here to work to change things that we consider to be wrong. 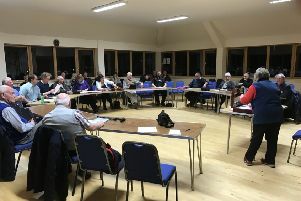 Argyll and Bute MSP Michael Russell said: “This is a great example of a positive outcome forced by a community coming together and making its voice heard.